Unlike the generic strength training routines found in fitness magazines, sport-specific strength conditioning involves a few more design variables and takes a little more planning. The first step, and perhaps the most important, is to evaluate the characteristics of the sport and to assess the athlete’s physical profile. Ultimately, a resistance training program should mirror the movement patterns of the sport as closely as is feasible. While early stages of the program may focus on developing a general strength base, as the competitive season approaches, conditioning exercises should become more specifically tailored to the sport. The same applies to the physiological demands of the sport – a cross country runner for example, requires high levels of muscular endurance. A volleyball player would benefit from explosive power and a football lineman from exceptional muscle mass. A hockey player would benefit from basic strength, explosive power and strength endurance. A conditioning plan is only as successful as the individual’s ability to commit to it. For most, training time is limited so the key is to prioritize. Although in an ideal scenario a soccer player would benefit from addressing explosive power and strength endurance needs, their lack of physical size and strength may be their greatest hindrance. A program to bulk the player up may have the greatest impact on their performance. The only way to ascertain the most appropriate program design is through a battery of fitness tests. Again, selection of appropriate tests comes from an evaluation of the sport. As a rule of thumb one repetition maximum testing for the upper and lower body is appropriate for most sports. The standing vertical jump is an obvious power test for a basketball player. The 60-second sit-up or push-up test would be suitable for many of the endurance sports. Consider finally, the phases of the sport season. Generally, early pre-season or off-season training is reserved for maximum strength and hypertrophy. For athletes new to resistance training an extended period of time may be required for functional or anatomical training – preparing the body for a more strenuous lifting program. Once a movement analysis of the sport has been considered and the strength objective for the program set (i.e. hypertrophy, maximum strength, power, strength endurance or a combination of several), the most appropriate exercises can be selected. Core exercises (those that incorporate one or more large muscle groups) should form the basis of a maximal strength or hypertrophy resistance training program. Examples include back squats, bench presses, dead lifts and should presses. Core exercises suitable for power development include power cleans, push jerks and snatches. When explosive power and strength endurance are more a priority (perhaps for a late pre-season strength program) more assistance exercises can be incorporated into the routine. Even though mirroring sport specific movements is an important design variable, it should not be to the neglect of other major muscle groups. A resistance training program should aim to develop balance throughout the body even if the sport has an upper or lower body emphasis. This is an important step in injury prevention. Many athletes choose to lift weights in three workouts a week. This often works well allowing sufficient recovery time and fits nicely into the 7-day week. More advanced lifters may benefit from a four, five or even six day a week program. Beginners are recommended to start with two, total body sessions a week. Guidelines from the National Strength and Conditioning Association suggest that there should be at least one rest day but not more than three between working each muscle group. At a minimum, a resistance training session that works the entire body could be completed Monday and Thursday or Tuesday and Saturday. Alternatively, it may be more suitable to use the split routine design – training different muscle groups on different days. Of course frequency design cannot be complete without taking other elements of training (such as speed and endurance sessions) into account. A resistance training program for a hockey player for example, might be coupled with plyometric training. In this scenario, only two resistance training sessions per week is feasible. The order in which exercises are performed in a session should not be overlooked. Sports conditioning is more demanding than general fitness training and with various forms of training often taking place in the week it’s important to maximize overload to recovery ratio. Notice how the sessions are split into the “upper body / lower body format” over the week. For the individual sessions exercises are ordered by a “push-pull” format. Assigning the right intensity or load to the exercises depends on two main factors… the training objective and the athlete’s current level of strength. Loads are usually assigned as a percentage of the athlete’s one repetition maximum. Strength endurance, on the other hand, is developed when a greater number of repetitions are completed (more than 12) and loads usually correlate to less than 67% 1RM. It’s important to remember that adequate overload, even when strength endurance is the primary objective, occurs when each set is performed to, or close to failure. Explosive power development is a little different. From the chart above, power for multi-sprint sports (as opposed to single power events such as Olympic Weightlifting) is best developed in a repetition range of 3-5. 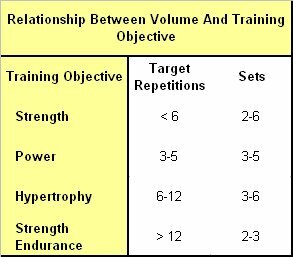 However, if exercises were performed to failure in this repetition range, loads of approximately 87-93% 1RM would be used. This is too heavy for substantial power production as it limits the athlete’s ability to generate speed of movement. Instead, the 3-5 repetitions are completed with loads of 75-85% 1RM with emphasis on the quality of the lifts. Research has shown that gain in both hypertrophy and maximal strength can be achieved with a single set per exercise. However, many more studies suggest that while suitable for beginners, more advanced lifters require additional volume to make further gains in strength. It’s also interesting to note that there is evidence that 3 sets of 10 repetitions completed without going to failure increase strength to a greater degree than 1 set of 10 repetitions completed to failure. Maximal strength training places the greatest demands on the neuromuscular system and requires the longest rest interval between sets and should last between 2-6 minutes. Resistance training for power demands high quality of movement and the resulting fatigue from too short a rest interval compromises lifting technique. Rest periods of 2-5 minutes are also recommended for power training. Rest interval of 30 seconds to 1.5minutes are suggested for hypertrophy and les than 30 seconds for improvements in strength endurance. From phase to phase over the course of a season, resistance training usually progresses from general strength to sport-specific power and strength endurance. The in-season sees a reduction in training volume where the goal is to maintain the gains made in the off and pre-season phases. From session to session loads and volume should increase gradually. The 2-for-2 rule is a useful guideline for increasing the resistance. For example, 3 sets of 8 repetitions may be prescribed for a particular exercise. When the athlete completes 2 more repetitions (i.e. 10 reps) on the final set for 2 consecutive sessions the weight should be increased. For smaller muscle groups an increase of 2.5-5lbs (1.25-2.5kg) is suggested and 5-10lbs (2.5-5kg) for larger muscle groups.